IT leaders describe their top 5 pain points in managing iPads and other tablets--and how they are addressing the challenges. At the end of the 2010-2011 school year, the San Diego Unified School District (CA) had 10,000 iPads in use and was set to add 18,000 more the next semester. Teachers and students were enthusiastic about using the devices, yet the district faced a serious problem: Teachers were reporting to the instructional technology team that using Apple Configurator and mobile sync stations to add new content to 30 iPads at a time wasn't working well. "They would lose a few in the process and end up having to do default resets," recalls Darryl LaGace, the former chief information and technology officer for SDUSD. "They told us this solution wasn't going to scale. We knew that it was risky when we started, but we didn't know how bad a problem it would be. We had to stop and research mobile device management solutions," says LaGace, who now works for Lightspeed Systems, an MDM company. But Sam Gliksman, the author of iPad in Education for Dummies, says this deficiency was apparent from the get-go. "Remember the language in the advertising when Apple first released the iPad? It was all about the device as a media-consumption tool, not a media-production device," he says. "Apple had no idea that schools would take them up the way they have. This was a big surprise to them, and they hadn't put any thought into developing management tools for them in that setting, because they didn't anticipate it." T.H.E. Journal interviewed a group of school district technology leaders in charge of significant tablet deployments about their deepest pain points during implementation and the solutions they have found. Here's what they had to say. 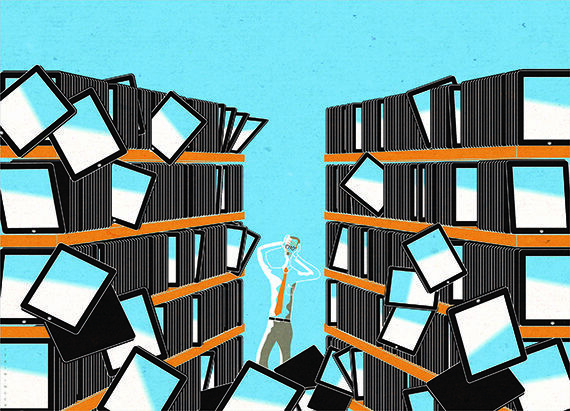 The most basic need with tablet deployments is asset tracking. Mike Guerena, technology director at Encinitas Union School District (CA), which has deployed 3,500 iPads, says his district is creating a homegrown tracking system. "We have been tracking iPads using an Excel spreadsheet. We didn't find a good commercial solution, so it is pretty labor-intensive now," he admits. "We have a person in the district office who handles tracking iPads in and out, whether they are damaged, tracking whether parents have bought insurance, and whether one has been damaged or not. Our goal is to automate that." Encinitas is creating a system in Filemaker Pro that will inventory all the technology equipment in the district, but needs to customize it for the data required to track iPads. The system will use bar-code scanners to link student IDs with the device serial numbers. Asset tracking also was a key issue for Norfolk City Public Schools (VA) as it assessed MDM vendors to help with its iPad rollout in 2012. In addition to its tablets, Norfolk also owns a mix of staff and faculty smartphones that it wanted to manage using an MDM solution. Between the iPads and smartphones, it has 1,700 mobile devices registered on the network. Directory service engineer Joakim Jader was looking for an MDM solution that would allow his team to easily track where devices are and how they are being used. After looking at several software options, Norfolk chose AirWatch in 2012 for its strong asset-tracking and reporting functions, says Jader. A dashboard view allows his team to track and view real-time device information. Jader points out that AirWatch is not an iOS-only solution. "We want the freedom in the future to move to Android or other types of devices," he says, "and not be locked in by the MDM solution we chose." In addition, he says, "We really liked their intuitive interface. It offered the flexibility to allow us to use the same naming convention we used for other computers in the district and keep inventory the same way. That was important to us." Robert Craven, director of technology and media services at Fullerton School District, has led iPad initiatives at Fullerton and Saddleback Valley USD, another California K-12 district with 32,000 students. Several years ago, when Saddleback tried to roll out a combination of 3,000 iPads and iPods, it was a beta group for the Apple Configurator tool, which Craven found was not robust enough to handle 1,000 new iPads. "You can configure perhaps 20 at a time," he says (the official number from Apple is 30). "It is a solution for independent schools or schools not getting support from their district." Indeed, the IT leaders we spoke to said that configuring their fleets of iPads and then purchasing and updating apps across the devices is by far their biggest challenge--and that Apple Configurator and Profile Manager are not adequate tools for large-scale deployments. Being able to easily manage these tasks is the key reason the directors mention for turning to MDM solutions and one of the key features they evaluate when considering an MDM. Tim Landeck, technology director of Pajaro Valley Unified School District in Watsonville, CA, explains the challenge of purchasing apps and software licensing using Configurator. "The way Apple has it set up, you need an Apple iTunes account to install apps. But if we use the teacher's account, then they own any purchased apps and we can't pull that app back to use in another setting the next year," Landeck says. Apple does have a volume purchase program, but Pajaro uses AirWatch MDM to push out and track the apps. "But we can't yet pull apps back," he notes. "There is no way to do that. We can't regain that installation code. It is something Apple needs to work on to allow." Encinitas' Guerena says his district started out using Apple Configurator for updates, with one cart per school. "But we found that the Configurator itself would cause problems, sometimes erasing apps or resetting the iPad to the original setting," he says. The original setup with apps took a long time--seven people doing 30 at a time, and they struggled to do application updates. Encinitas later turned to JAMF Software's Casper Suite to customize preferences and push out apps. Gliksman has found Profile Manager, Apple's tool for enterprise-style configuration of iOS (and OS X) devices, has similar limitations as Configurator. "I think Profile Manager does an adequate job of setting up profiles," he says. "You can run it off any laptop. But I think for larger installations you are better served with an MDM solution." But even having an MDM solution in place doesn't mean you can wash your hands of Apple Configurator. Landeck points out that he first has to put the iPad into "supervise mode" in Configurator in order to use the MDM. "So initially we have to bring it into IT and plug it into Configurator. That is the only way to use MDM," he says. "Another gotcha is that to get it out of supervise mode, you have to go back to the exact same computer to take it out. A different computer can't do it." But MDMs do allow for creative management. Landeck says Pajaro is working on a feature with AirWatch that allows the district to push out "time-based" profiles. "We could say we need these certain apps on this set of devices at 10 a.m. for a science class, and then the same devices get a different set of apps for an English class at 11 a.m. We're excited about it." There are more than 50 MDM solution vendors (see the sidebar on page TK for a partial listing). Most of these systems, however, are designed and priced to work in corporate settings. "Most MDM vendors charge an annual fee per seat, so you really have to make a commitment to them," notes Guerena. Lightspeed's LaGace found the same pricing-model problem when he worked for San Diego USD. "The [companies] that didn't have education focus were talking to us about licensing fees in the range of $20 to $50 per seat annually," he says, which LaGace feels is unrealistic for most schools. When Lexington County School District One (SC) looked at MobileIron, Thomas Burgess, the district's network engineer, liked its user-friendly interface. But 2½ years ago, MobileIron had no educational pricing, he says. "We were looking at $75 per device, or about $300,000 to $500,000, which was way too much," Burgess says. "But they worked with us to develop pricing. We signed a deal with a reseller that is coming up for renewal, and we are going to extend the same contract. Basically, we pay licenses for 2,000 staff devices, but then all the student devices are free." Not every district has had success in negotiating affordable MDM contracts. Gene Tognetti, vice principal at St. Leo the Great School in San Jose, CA, is in the second year of deploying about 60 Toshiba and Samsung Android tablets, and has been disappointed in trying to find MDM the school can afford. "When we looked at any solutions that would help automate app deployment, it seemed the same story: They weren't geared toward the educational setting," he says. "They were corporate offerings rebranded or not even rebranded. And the pricing could be in the thousands." In addition to grappling with the MDM pricing issues, Tognetti is still looking for the right tool to manage Android tablets. "We saw one that would push apps out, but still required some activity at the recipient end to finish the install. We can't ask a first-grader to do that," he says. Tognetti's team ends up doing those updates manually. "It has been a real pain for us," he says. "We have chosen to limit the number of updates we do to three times a year, instead of when the apps' developers push out updates." St. Leo's IT person found a free batch installer, but he still has to hook up the tablets to a PC one at a time. "I am stunned that we haven't found a simpler solution," Tognetti says, "and have to cobble together different manual, labor-intensive solutions." Tognetti hopes a tool called TabPilot is what he is looking for in terms of reducing management workload for Android tablets. St. Leo has recently signed up for a trial run. Joel Pedersen, superintendent of Cardinal Community School District in Eldon, IA, says that after initially looking at iPads, he and technology exec Cameron Chamberlin took a risk by going with a cloud-based startup called CurriculumLoft and 600 of its Kuno Android tablets. "No one had ever heard of CurriculumLoft," Pedersen says. The iPad would have been the easy choice, "but we were concerned about management issues. This Kuno tablet solution is locked down and totally focused on education. We have total control of all apps and real granularity. We could buy one copy of one app if we thought one child could use it and just push it out to that tablet for this year. Then next year, we could have it available for another student." CurriculumLoft combines MDM, content filtering, and a learning management system into one. Pedersen says, "So far, it has worked well. The tablets are pretty good. But in terms of content management and device management, this solution is perfect." He adds, "We have 600 students and a very small tech team. We didn't have to change anything for this rollout. In fact, we had to have a classroom technology coach for teachers through much of our previous MacBook deployment. But we didn't need that for the Kuno rollout this year, so we saved on staffing there. The teachers can handle the majority of changes related to what apps and content the students need to access." Pedersen says he and Chamberlin know the technology is going to change and that they may use some other type of device three years from now. "But the content in the cloud we are using keeps getting richer, and we can hang on to that," he says. "I stress to teachers that the device is not the most important thing. The content is." When tech leaders from Spartanburg County School District Three(SC) looked at tablets, they decided that any of the devices on the market would be fine pedagogically. So for them, the decision came down to which was the easiest to manage and the most cost-effective. Like many school districts, Spartanburg is in a Windows environment. "We focused on how the devices would fit into our existing infrastructure, and we are a Windows shop, with Active Directory and other tools to provision our group policies," says Donnie Elder, the director of technology. "We want to leverage what we have in place without having to purchase any additional management software." According to Eric Levitt, the assistant superintendent for instruction, this year Spartanburg is piloting Dell Latitude 10 Windows 8 tablets with teachers and students. In August, the district will roll out the first phase of 1,500 devices in high schools and middle schools--to be followed by about 1,500 more in K-6 schools. "So far, we can meet any challenges around these additional tablet devices with our existing infrastructure," he says. As far as management goes, these Dell tablets are just like additional laptop PCs, Levitt says. In fact, Dell says third-party testing shows that the Latitude 10 requires 52 percent less time to manage than the iPad in large-scale education deployments. Levitt adds, "We also recognized that we would not be able to use 15 of our software packages if we were not in a Windows environment. But as it is, there is not a program that doesn't work with the new Windows 8 package." The tablet initiative does require an additional time investment, Elder notes. "But they are issues we have dealt with for years, such as imaging devices. We don't have to develop new skills, so our total cost of ownership is a lot less than if we had jumped into iPads. We have seen other districts have to put in place pretty convoluted solutions for iPads. We can't believe how those solutions have been lagging."